Amazon S3 has a special services that help you to store and retrieve your amount of data, at any time, from anywhere on the web browser. Before you start to uploading your data. 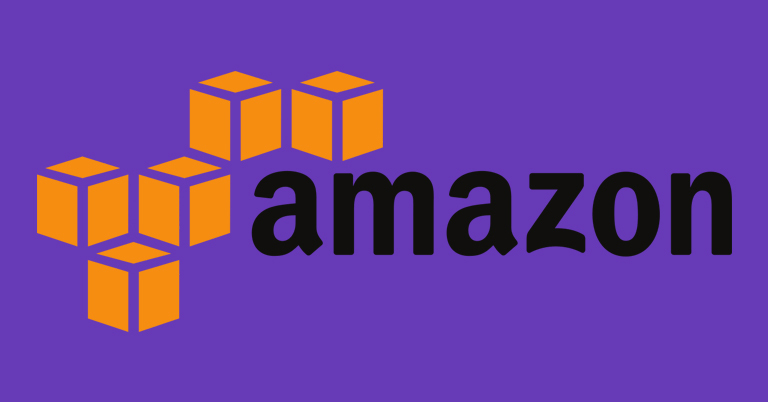 You need to create a buckets in AWS region to store your data in. The owner of buckets is AWS account who create it. By default, Each one are able to create 100 buckets in one AWS accounts.You have options to increases the buckets limit if you need it. 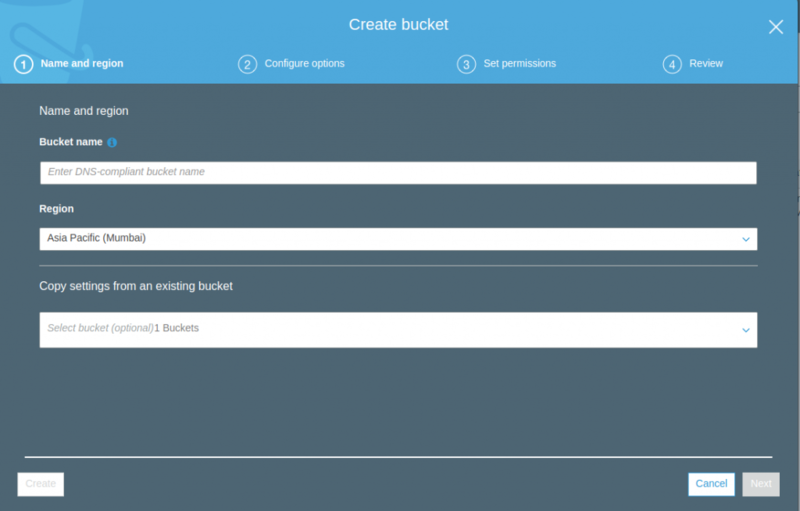 2. select Create bucket options in s3 console. 3. On the “Name and region” filed, give the name of your buckets you wish to create. On the “AWS Region “ field, select your region where you want the bucket to reside. We recommanded you to select a region close to you to reduce the latency and costs, Also, there is optionl filed in its , thats helps to create new buckets with old or existing buckets. This is a optional one. If you complete it. Click next. 4, On the Configure options page, you can modified the s3 buckets properties. A) Versioning : if you are enabled it on buckets, you to keep multiple versions of an object in that buckets. B) Server access logging : Server access logging features help to make log information to new buckets and saved it in another buckets which you want save. C) Tags: to annotate billing for your use of a bucket. D) Default encryption: You can enable default encryption option for a bucket. After that, the data will be encrypted when you are stored in buckets. E) On the Set permissions page, you can modified your buckets permission as your reqeiremets. By defaults settings, public has no permission to access your buckets in S3, if you wish to access your data in public browser, just uncheck it. F) After you create a buckets,you need to set permission as public for the buckets and that’s objects if you wish to access your data in browser. 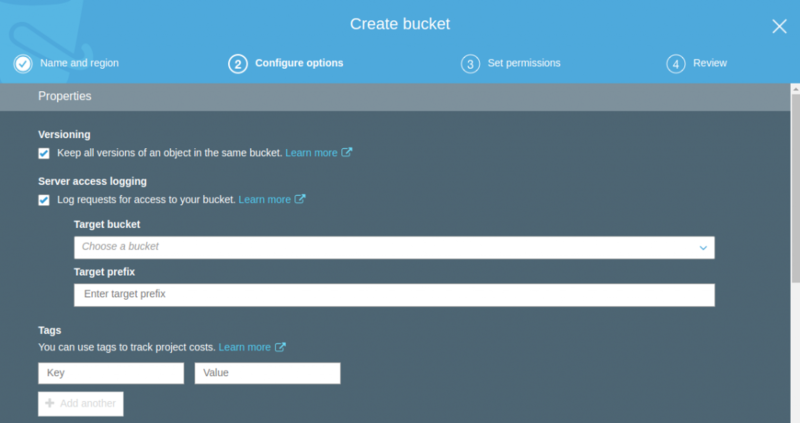 In order to make a buckets in public,you goes through access control list option in created buckets and make it as public. If you are make the object as public . You can access your data using buckets URL. As per above the steps, we have created a one buckets named as syslint and uploaded a sample object named image.png to it. Also, we have set the buckets and object permission as public. Then, you can access it in browser.